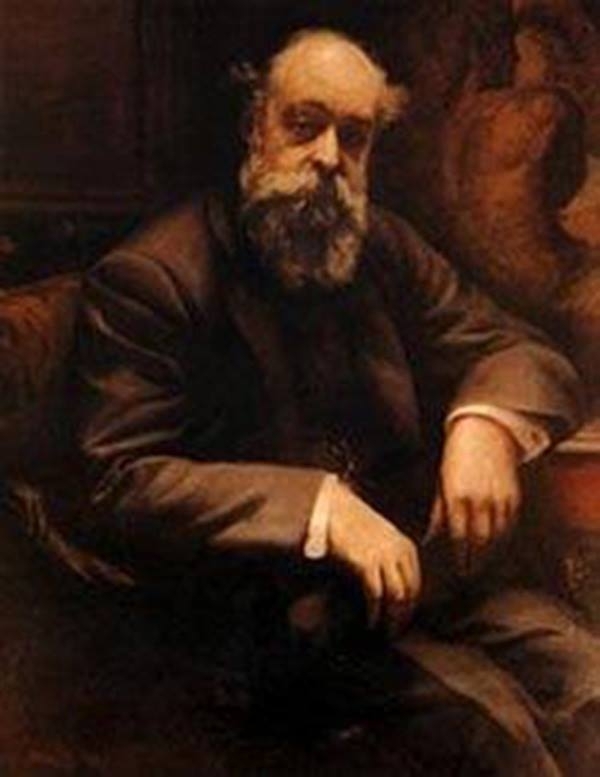 The count Eusebi Güell y Bacigalupi (1846-1918) by Victor Moya-Museu d'Historia de la Ciutat-Barcelona. Eusebi Güell i Bacigalupi, ICount of Güell (Barcelona, December 15, 1846/Ibid. July 8 1918) was a Spanish industrialist and politician, especially known for having been modernist architect Antoni Gaudi´s patron. His father was Joan Güell i Ferrer (1800-1872), born in Torredembarra, an "indiano" who made an enormous fortune in Cuba and developed various industries on his return in Barcelona. In 1840, he founded El Vapor Vell factory in Sants, and got the sole right for the manufacture of velveteen in Spain. His mother was rancesca Bacigalupi I Dolcet, from a Genoese family settled in the condal city since the late XVIII century, who died at giving birth to Eusebi. As well as his father, he created new companies in the most promising sectors of the time. Due to his family situation, he was able to study Law, Economy and Applied Sciences in Barcelona, France and England. He associated with Ferran Alsina, and they both started a velveteen factory, situated in Santa Coloma de Cervelló, basis for the future Güell Colony (1891). In 1901, he founded the Asland Pavement and Portland General Company (Castellar de n´Hug) and was advisor in some of his family in law´s companies, such as Hispano-Colonial Bank, Plillipines Tobacco Company, Spanish Transatlantic Company or Spanish North Iron Roads Company. He was also involved, with Count de Romanones´family in the Spanish Rif Mines Company, where his son, Antoni Güell López was vice president. In 1878 he met Gaudí, after admiring a showcase for the Comella glove factory that the architect was exhibiting in the Paris Universal Exhibiition. A long friendship and a productive professional relationship started then, since the industrialist was the architect´s major patron. Owing to this, his name is known all over the world, with works as the Güell Colony Crypt, the Güell Palace, the Wine Cellars Güell. In 1871 he married the Marquis of Comillas´eldest daughter, Luisa Isabel López Bru (1851-1924), with whom he had ten children: Isabel, Maria Lluïsa, Joan Antoni, Maaria Cristina, Eusebi, Claudi, Santiago, Francesca, Josefina and Mercè. In 1908, King Alfonso XIII appointed Eusebi Güell Count Güell, for his contribution to the economical growth of Spain. He also appointed Güell`s youngest sons Viscount and Baron. In thanks for this, they passed the Royal Palace of Pedralbes, an old family state, to the monarchy. Eusebi Güell died on July 8th, 1918 in his Güell Park house (Barcelona), at 72.